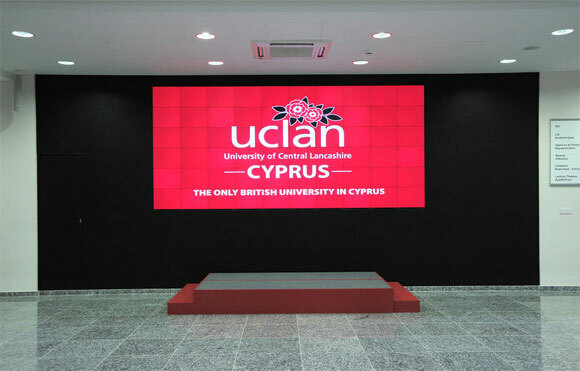 The first welcoming message that international students receive when they enter the new €50m University of Central Lancashire (UCLan Cyprus) campus, near Larnaka, is delivered from a unique Christie MicroTiles display — part of a much larger deployment of Christie digital tools featured in this breathtaking fit-out. The cutting-edge university offers not only premium British higher education but also a technological breakthrough in the way in which students can engage with the digital teaching methods — and this is all thanks to Christie’s island-based distributors ALA Equipment Company Ltd, who have constructed an advanced Learning Information Systems (LIS) network. If the advanced site wide HD signal transmission provides one of the unseen achievements, it was the Christie MicroTiles wall display that first wowed the building’s architect, George Lyssiotis. ALA had already become an early adopter of MicroTiles on a grand scale, first specifying 170 modules at Malta International Airport in 2011 before following this up with a multi-purpose 10 x 6 foyer display at UCLan Cyprus’s 40-acre site at Pyla. And by providing a European debut for the new Christie JumpStart content management solution, designed for large tile displays, ALA has been able to create additional versatility for the next generation videowall, which combines an LED light source with DLP® optical imaging to provide extreme visual acuity. JumpStart operates in conjunction with an Extron HD matrix, the HD display itself driven by four Christie ECU’s (External Control Units), fed by fibre optics extenders to offer a total resolution of 3840 x 2160 pixels. As a result, during the day it can be used either as a multi-window or single display to promote the university, but after hours it can also cross mix from the 310-seat lecture theatre and function as a relay screen — thereby increasing access to both the lectures (and boosting general theatre capacity) in the atrium. “MicroTiles can operate in multi-windows from the sources in the auditorium, with the display partitioned and overlaid through the JumpStart, which manages the entire canvas from the control room,” states Piemonti. The integrators had been tasked with creating a flexible, multi-mode infrastructure for this lecture theatre and responded by specifying a powerful 10,000-lumen Christie L2K1000 3LCD 2K resolution projector as part of a 5.1 surround environment. However, this is likely to be relocated as soon as the second phase is complete next summer in favour of a Christie DCI-compliant 2K platform, to accommodate full digital movie delivery. With Polycom 8000 videoconferencing also forming part of the package, it is little surprise that two 42U rack units occupy the main control room, with an enormous quantity of Extron’s matrix switchers, scalers and twisted pair transmitters handling all the video distribution. Outside the control room a Christie LX400 serves as a preview display for the guest speaker on stage. In fact the LX400 is fairly ubiquitous. Over in the teaching areas, of the first 15 classrooms to be equipped, two have been fitted with a double Christie LX400 projector while the remainder comprise single LX400’s, ceiling mounted using Euromet Arakno brackets. The HDMI signal is delivered to the projectors via Extron Twisted Pair Extenders that carry the required RS232 control signals. The Christie LX400 has been a real revelation, confirms Piemonti. “We chose this projector because the University wanted a superior performance, high brightness projector from a top brand name. Another brand had originally been under consideration but the customer was happy to switch to Christie when he saw the impressive results delivered by the projector. Helping to optimise the projector is the choice of the Euromet Arakno bracketry. Each room is equipped with a 2-metre wide ScreenLine motorised front projection screen, connected to the Extron control system and a custom double racked/double faced lecture podium (fabricated by ALA). The remainder of the AV equipment operates under advanced Extron control and connectivity, with 7in touch panels in each room and SMART Podium 17” interactive LCD pen display at the lectern. Each classroom has been equipped with a versatile infrastructure and a number of available inputs — with a VGA input direct back-up to the projector for redundancy — and eight audio stereo inputs. On the large touch screen, resembling a giant iPad, the teacher can edit and interact in real time with any presentation via the 17” interactive pen display without obstructing the screen, thus removing any stress from the teaching method. At the same time he has full control of the classroom via an intuitive GUI loaded onto the Extron 7in table-top touch panel which provides the ability to control any video, audio and lighting presets in the classroom. This network-based AV solution not only provides immense functionality but all diagnostics and healthchecks can be carried out remotely online via Extron’s GVE management system. The entire technical infrastructure is near miraculous — not only for ALA’s future proof design but the speed with which they reworked the original topology after being brought in at the last minute (they had only learnt about the University AV project three days before the tender deadline). The company managed to carry out full turnkey planning and implementation in just the final three weeks of a fast track build time that was itself accomplished in only 180 days. ALA also demonstrated that they had the economic backbone to support a technology contract valued at €700,000, which needed to be commissioned in time for the start of the new academic year 2012. Andy Belcher, UCLan’s own AV technician, responsible for providing teaching support, was delighted with the fulfillment. Tracing the project he confirmed, “Initially we had opted for a tender from the UK but right at the last minute ALA produced another tender and set of drawings. “We knew how we wanted the installation — but this is far different and a lot more advanced than our original design, which was much more simplistic. Even more appealing — thanks to this advanced deployment — is the possibility of distance learning and lecture capture whereby seminars conducted 3,600km away in Preston, Lancs, are transmitted to Pyla.